Much of the debate around intercounty gaelic football at present, now we are in the off-season, has revolved around the 5 experimental rules proposed by the GAA’s Standing Committee on the Playing Rules. If approved, these rules would come into effect for the 2019 National Football League but not for the 2019 championship. I’m very underwhelmed; being honest I’m very disappointed and hope these rules are not introduced. Gaelic football in 2018 was often less than entertaining to watch. Going by these proposed new rules, it’s clear that those in charge want there to be more turnovers of possession, more long kicking to tall players and less possession-based football from now on. 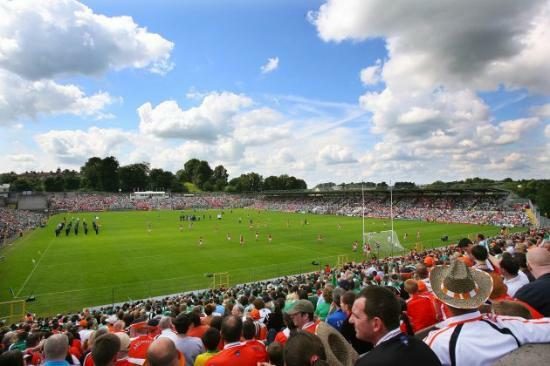 As the GAA has become more and more business-like, so has the focus on intercounty football as an “entertainment product” increased. 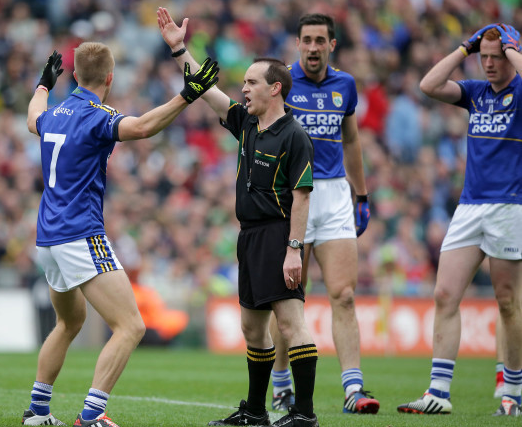 There are two main reasons why gaelic football has evolved into what it currently is: poor enforcement of the playing rules by referees, and an increase in physical capabilities of players. The combination of these two has resulted in the game having fewer turnovers, more fouling from frustrated players and a lack of space on the pitch. Gaelic football, like rugby or soccer, has evolved into a possession game. Once a team has possession they control the clock, they control scoring, and it is very easy to hold onto the ball as per the rules currently enforced. It is difficult, legally, to dispossess the player with the ball. The first two rules, regarding limiting consecutive handpasses and only playing sideline kicks forward, are a case tackling the end result without getting to the root of the problem. If less possession is what those who control gaelic football want, there are two very easy ways to do so. The elephant in the room in gaelic football has always been about “defining the tackle”. When I was growing up there were two ways to gain possession. Play the ball with one hand and take it from an opponent, or make a fair physical challenge with the body causing the opponent to lose control of the ball. Both of these have been destroyed in the last 20 years. The physical challenge has been diluted and diluted to the point where shoulders or physical challenges are rare – they even bring about a cheer bigger than a goal at most games, such is the rarity of seeing a good physical hit. Second, playing the ball with the hand without being penalised has become more and more difficult. My dad taught me to tackle, and for a forward I wasn’t bad. “You just wait until the guy with the ball goes to play it”, he explained, “and as soon as he does, tip it away. Remember, he has to play it within 4 steps. So use your feet to stay close and he’ll either overcarry, or he’ll play it and you’ll take it.” Quick feet and eyes on the ball. Easy. Sadly however, referees don’t enforce carrying rules and players routinely take more than the allowed amount of steps. It is manageable to shadow an opponent’s run for 4 steps; it is very difficult to do so when your opponent can take 10 steps. One assumes referees allow too many steps in an effort to reduce the number of times they blow the whistle and keep continuity in the game. Rather than encouraging play, however, this only makes tackles rarer and frustrates defenders into conceding frees: while referees let overcarrying go, in their own minds to have fewer frees, paradoxically they are encouraging more foul play and certainly more possession football. 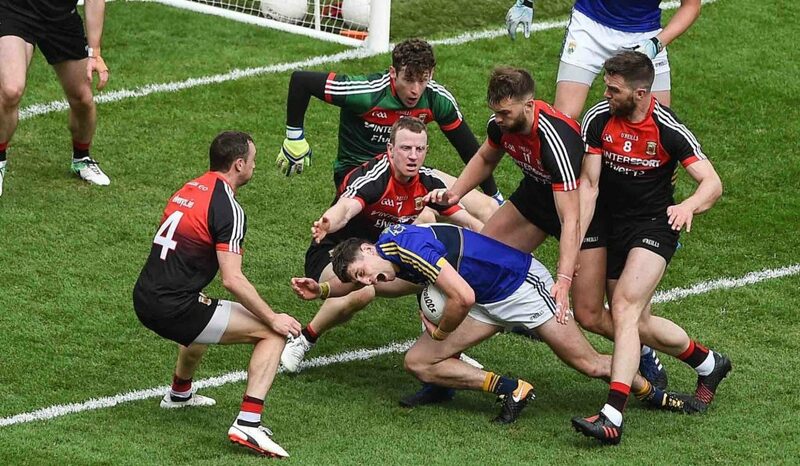 Something which has become very noticeable in any gaelic football match I’ve watched over the last few years is the prevalence of the group (swarm) tackle. It is not that defensive skills are reducing so players cannot dispossess an opponent on their own. No, rather it is that the group tackle is frequently rewarded. Watch what happens when a player is tackled by just one opponent and compare it to what happens when a player is tackled by several opponents at once. 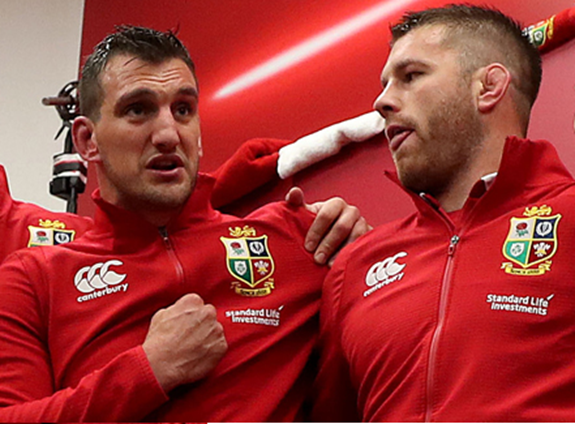 When a player is put under huge pressure by just one tackler, he will often win a free. Yet when three tacklers do the exact same thing to a player, that player will concede a free for overcarrying (even if he has not done so). Believe it or not, massed defence is currently being encouraged by referees. Refereeing solely by the rules will fix it. Sometimes an individual tackler will foul, sometimes he won’t and sometimes a group tackle will and sometimes they won’t. 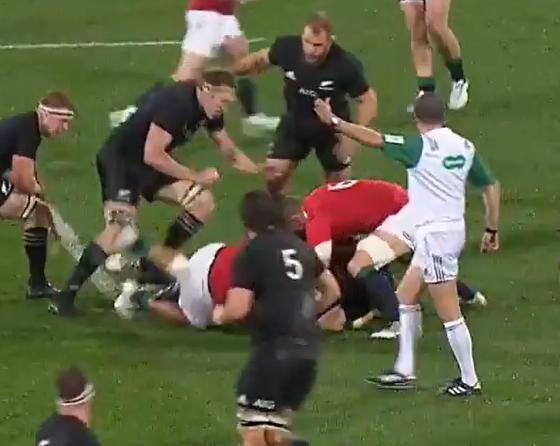 There is a trend of rewarding the group tackle and penalising the individual tackle. Players and coaches will do what’s effective, and the group tackle is very effective as a result of this refereeing trend. This is encouraging massed defence. Physicality has been largely killed from the game. A well-timed, well-executed shoulder is one of the finest skills in the game. The rule makers and rule enforcers have done their best to kill off physical challenges, which is very sad. A shoulder to shoulder contest frequently results in a free or the ball-carrier throwing himself to the ground. Referees don’t seem to want to allow physical challenges or too much aggression. An attempt at a shoulder which isn’t absolutely perfectly times is likely to get a player sent off: as a result fewer players even try to make legal, physical challenges. Growing up in the era I did, a centre back meeting a player running through with a well timed, legal hit was a joy. Centre backs like Keith Barr, Stephen O’Brien, Conor Counihan or Glen Ryan were excellent footballers who were also hard, physical stoppers at the heart of their teams. In my opinion, the removal of the physical holding centre back has in large part led to massed defences (and the “sweepers” so many hate). 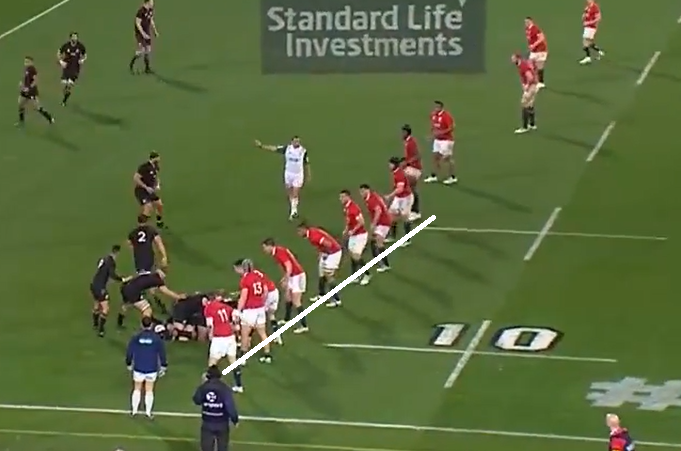 Physical challenges on ball carriers coming from midfield are a thing of the past, and so teams line up 3, 4 or 5 players in this area looking to swarm the ball carrier instead. Handpasses and kicking sidelines forward may remove some of the possession aspects of the game, but these two rule changes entirely miss the point. 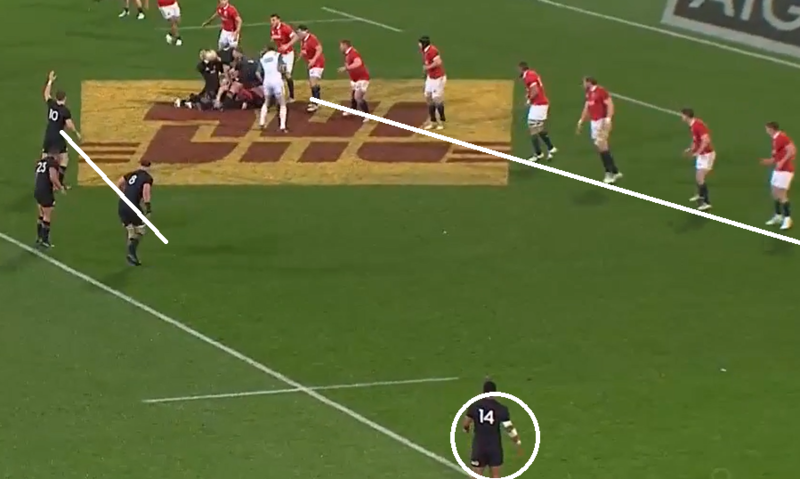 The mark rule will reward big full forwards and kicking the ball long to them. People are sad to see the long, high ball gone from the game. But was this long, high ball really what we loved, is it what we long for? 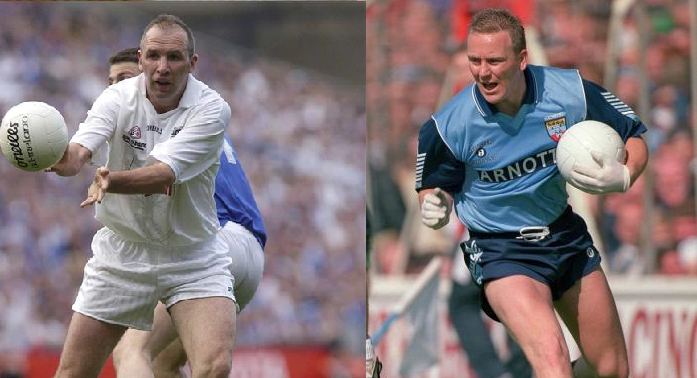 When I was growing up the forwards I looked at and admired were guys like Peter Canavan, Mickey Linden, Padraic Joyce, Declan Browne, Bernard Flynn, Colm O’Rourke, Mattie Forde, Maurice Fitzgerald, Colin Corkery, Stephen O’Neill, Steven McDonnell, Benny Coulter. Ask me would I rather watch a Kieran Donaghy at full forward or a Peter Canavan, and I’ll say Canavan every day of the week and twice on a Sunday. And you can swap in any of those other players I’ve named for Canavan. Skill, speed and accuracy are what I want to see in forwards, not big fellas catching marks. That’s Aussie Rules people should watch if that’s what they’re looking for. The mark rule change misses the point. Making the game about kicking again isn’t a case of forcing teams to do so, or creating rewards for it, it’s simply an issue of SPACE. What we are missing from the game is space in front of goal for skilful, fast, agile forwards to play in. Not big balls lumped in towards tall players. If there was space in front of goal, everyone would kick the ball. This rule will bring in tall full forward players, which I’m not in favour of. Creating space in front of goal, and all over the pitch for that matter, is what we need. How to do this? Not by forcing teams to do so, not by rewarding tall players who can catch balls lumped in, not by backcourt rules I’ve seen some mention and not by forcing players to hold positions with ridiculous zonal rules (like having to keep 4 men inside the 45 or other similar nonsense). Space in attack leads to long kicking in front of full forwards and great scores. Creating space should be the priority. There are just too many players on the field at present. 15 is too many. 15 players, in the physical condition they currently are in means there is zero space on the pitch, especially when you factor in a ball that, unlike hurling, can only travel about 50 metres accurately (at most). We are all told when we’re under-12 that “the ball moves faster than you ever will” – with current conditioning levels that gap is now minimal. Reduce the numbers on the field to 13 for each team and plenty of space will open up, letting players use the ball optimally (i.e. they will kick it more as it will make more sense to do so). There is no good reason I have ever heard for not reducing the number of players. I have never been a fan of the black card. But with these proposals you can get two yellows and you miss 10 mins? Then come back on and you’ll need a third yellow to be dismissed. Come on. 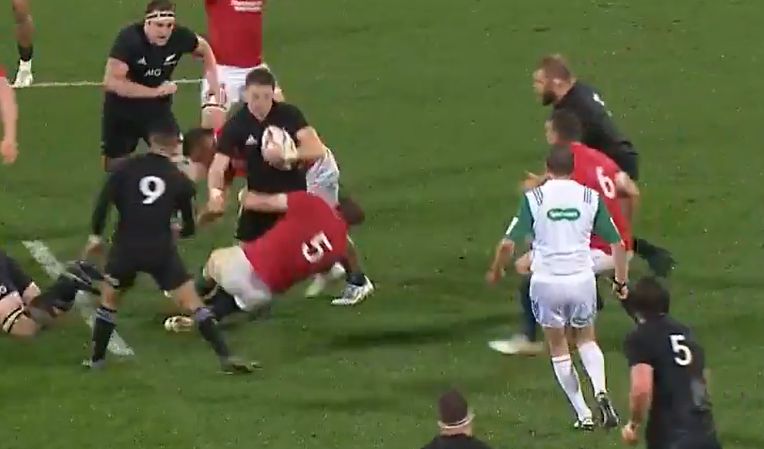 A Sin Bin instead of a black card is not a bad option, but not in this form. 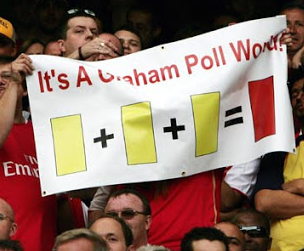 Allow it to be introduced instead of the black card, or even better, instead of the black AND yellow card. So you are off for 10 with either black or yellow, then come back on and if you get any other card you’re off permanently. But two yellows, then a third? A poor idea in it’s current form. As gaelic football is currently played, being a possession game, the kickout is the only time a team gets to contest possession. With this new rule only one kind of kickout will be allowed: a long ball past the ’45 to midfielders. I really enjoy watching high fielding from kickouts and personally like when the ball is delivered long to be contested. The GAA has already brought in the kickout mark which tries to encourage long kickouts. However this latest proposed amendment to the kickout rules goes too far. Whoever has the best midfield and goalkeeper will win every game as they’ll win most possession. It’s as simple as that, and it’s a punishment for teams who don’t have strong fielding midfield players. The short kickout came into vogue with Cluxton who has made it an art, but it is used lots by smaller teams or teams with weaker goalkeepers. It concerns me the will for more and more big players to be rewarded in the game and this rule does that. From being a game where your team decides how best to win possession based on the strengths of your personnel, the game now becomes about who has the two best fielders. It is also worth noting that in a country where games are frequently affected by wind, even the best goalkeepers sometimes struggle to get the ball past the ’45. Gaelic football has become a possession game. Teams prefer to carry the ball and use short passing to hold possession and advance the ball upfield rather than kicking it longer. 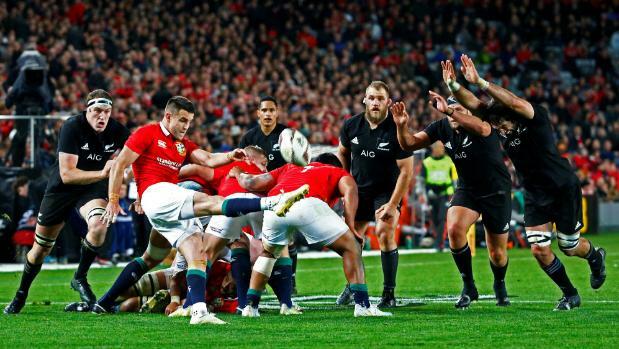 Kicking longer is a risk because there is such limited space on the field due to playing numbers and the physical capabilties of those players. 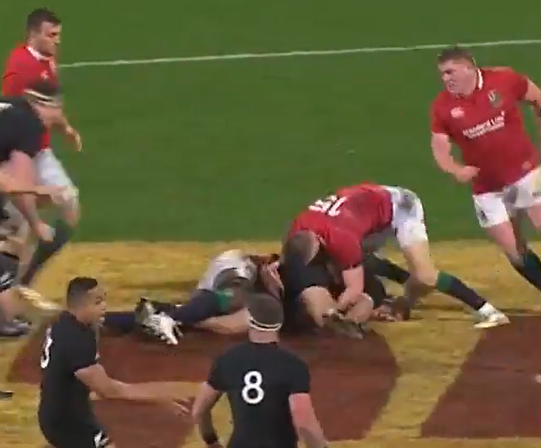 Physical challenges on ball carriers have been discouraged, and fairly tackling the ball with the hand has been also discouraged through normalised overcarrying. . The root cause is what we need to tackle, not the manifestation. We want more long kicking: the GAA is trying to do this with both the carrot (the mark) and the stick (kickout rules). Opening up more space will organically lead to exactly what we want. We want more turnovers: the GAA is trying to do this with the stick twice (handpass rule & sideline rule). Creating an environment where players can challenge for the ball when it’s in an opponent’s hands will again organically lead to the desired solution. Kicking will be encouraged by making more space on the field. Reducing the playing numbers to 13 will open this space we need so much. Massed defences will cease to be an issue with reduced playing numbers. In tandem, allowing some physicality back into the game will create more turnovers we badly need. So too will more accurate refereeing by following the rule book more closely, specifically with regard to overcarrying. If the ball has to leave a player’s hands every 4 steps, we will see lots of legal challenges on the ball in one-on-one tackles, and more turnovers. It’s fair to say Tipperary hurlers under-performed this year. They have failed to progress past the Munster round-robin series, finishing the season with two draws against Cork and Waterford and two losses to Limerick and Clare. 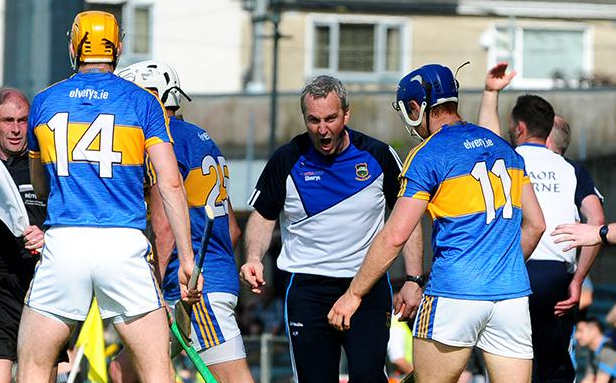 Michael Ryan is coming under pressure from within his own county. Many will be wondering with so many talented players at their disposal, how could Tipperary not manage a single win out of four games in the Munster championship. Something noticeable throughout the year was the number of changes Michael Ryan made for each game in the league and championship this year. He never settled on a team, trying out many players in every position. I decided to have a look at those selections. It is inevitable that there will be injuries in any squad. For example, Seamus Callanan missed much of the year through injury. Noel McGrath also missed a chunk of games through injury. There is also the need to try players out during a league campaign. Teams with too settled a side often regret it, having few options available on the bench come championship time. Having a look through which players played in which position most often makes for interesting reading. A couple of positions were nailed down. Jason Forde started 10 of the 12 games at full forward. Padraig Maher started 9 of the 12 games at centre back. Centre forward appeared to be Noel McGrath’s spot until injury hit, and was then the number 11 jersey was given to Billy McCarthy until McGrath returned. That though is where the structute ends. Paul Maher and Darragh Mooney both had two games each in the league before Brian Hogan was given a chance. Even then Mooney came back in for the league semi-final and final before being dropped for championship for Hogan. Full back was the most problematic position for Tipp all year. James Barry and Tomas Hamill were both given half the league campaign each at full back, before Kilkenny and Walter Walsh destroyed the Tipperary full back line in the League Final. Neither Barry nor Hamill played a single minute of championship hurling since, with untested Seamus Kennedy handed the role. Wing back was also a spot where many were tried, 10 different players starting there during the year. Eventually Joe O’Dwyer nailed down one spot, but he had only started 1 league game. Barry Heffernan played most of the league but only got 1 championship game. Sean Curran started every league game at wing forward and the first championship game, before being dropped and only making one substitute appearance in the last 3 games. Corner forward was a revolving door, 10 different players getting starts, with John McGrath and Michael Breen starting most often. Breen had just one substitute appearance in championship. Perhaps most surprising is that Cathal Barrett only started 3 games all season, and John O’Dwyer even more surprisingly only started 2. Here’s the Tipperary team showing those who most often wore each jersey during the season. Having a settled team is not a necessity, but I am a believer in having at least a framework to add in and take out players a manager wants to try. By all means try out players, it’s essential, but keeping one or two players in each line more or less constant through the year helps those coming in. Here’s what Tipp’s team could have looked like, and how I personally would like to have seen them line out in a championship game. Ryan can not be accused of taking the league too seriously. Yes, Tipperary reached the league final, but that was more down to the amount of talent at their disposal than it was about consistently picking their top players in pursuit of wins. Experienced managers like Brian Cody have trying out new players down to an art at this stage. Kilkenny this year tried out lots of players in many of their positions, yet they held their structure. A team which is evolving (in transition we were told! ), yet Cody tested and tweaked without hurting the team’s cohesion. Eoin Murphy was goalkeeper. Padraig Walsh full back with Paddy Deegan and Joey Holden next to him. Cillian Buckley at centre back, TJ Reid at centre forward and Walter Walsh at full forward. Around these 7 players Kilkenny slotted in different players at midfield, wing back and on the flanks in attack. Management is a steep learning curve. I hope Michael Ryan is retained by Tipperary although he will come under huge pressure. He will have learned a lot from this season, and will make the changes needed. For the job he has done, he deserves another year. One thing is for sure. With the amount of talent available, if they can settle on their best team, Tipperary will be a very dangerous animal next year. Kilkenny against Wexford at Nowlan Park on Saturday evening was always going to be one of the games of the year. Much was made of the four weekends in a row that Wexford had to play in the run up to the Kilkenny game. Whether that made a difference I cannot quantify. Frees and freetaking played a large part in the Kilkenny victory on Saturday night. 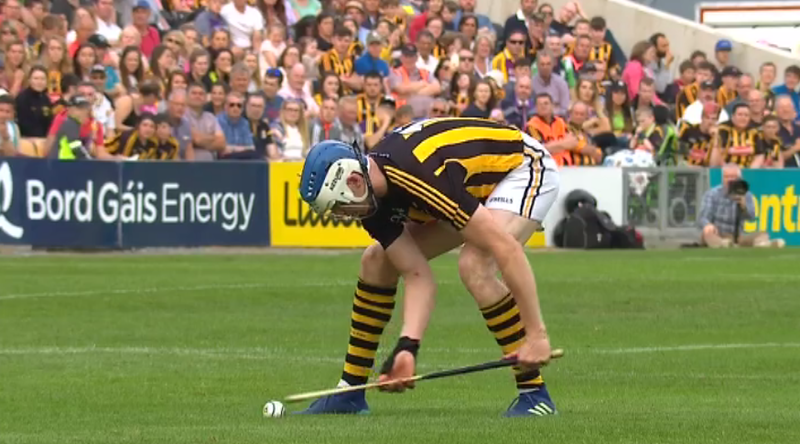 Here is the Kilkenny freetaking from the match. Kilkenny had 6 frees inside the Wexford half, and scored 5 of them, with just one unexplainable miss from TJ Reid from the Wexford 45 in front of goal just before half-time. The frees were taken by Reid, apart from one monster point from inside his own 45 in the first half from Eoin Murphy. In contrast, here are the Wexford shots at goal from frees in the game. Wexford used a mix of freetakers, with Rory O’Connor having 5 shots, Padraig Foley having 5 shots and Mark Fanning having 2 shots. Just 3 of Wexford’s free in the entire game were in Kilkenny’s half, with 9 of their free shots at goal coming from their own half. We can see the positions of the frees awarded to both sides here. We can see that Wexford’s frees were mainly awarded centrally just inside their own half, whereas Kilkenny won frees either inside Wexford’s 45 or down the wings. Kilkenny put up a shield of players across midfield and their own half-back line in the second half and were very aggressive in competing for the ball in that ares. In addition, Wexford’s running game and lack of ball winning options close to goal meant that most of their possession was in their middle third. In contrast Kilkenny won more ball close to goal, and played ball down the wings often. Wexford manager Davy Fitzgerald spoke about the refereeing after the game. “We only needed a point [at the end]. I could pick two or three examples where we could have gotten a point. Where we should have got a decision going our way, we found it very hard to get frees out there today” he told Sky Sports after the game. I agree with Davy’s summation to an extent. I feel that the refereeing was more lenient in the second half, and that’s despite more frees being awarded than in the first half. Kilkenny stepped up their intensity, put massive physical pressure on Wexford players, and Davy may be right that many frees were not awarded which could or should have been. However, the success rates of each teams’ freetakers was really key. What can be seen from the numbers is that Kilkenny have two brilliant freetakers in TJ Reid and goalkeeper Eoin Murphy on the very long-range frees. Reid hit 8 out of 9 (89%) with only that one miss, and Murphy hit his one free successfully (100%). Kilkenny scored 9 out of 10 (90%) frees on the day (in addition TJ Reid also scored a 65). In contrast, Wexford were far less successful with their frees in the game. They used three freetakers. 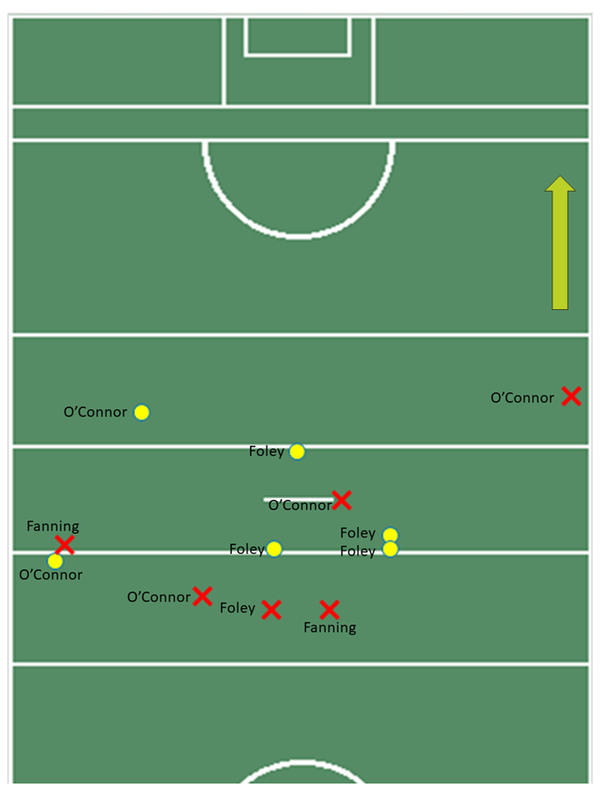 Rory O’Connor scored 2 out of 5 attempts (40%), Padraig Foley was better getting 4 out of 5 attempts (80%) while Mark Fanning was unsuccessful with his two long range efforts (0%). Overall Wexford scored 6 out of 12 frees they had, for a 50% success rate. That’s a big difference between the two teams: Kilkenny at 90% and Wexford at 50%. While I am in agreement that Wexford were hard done by at stages in the second half with some refereeing decisions, I am a believer in controlling the controllables. Wexford may legitimately have issues with some decisions, but that cannot control the referee. They can, however, control their own freetaking ability. Having a reliable freetaker is an issue that has followed Wexford for a couple of seasons now. 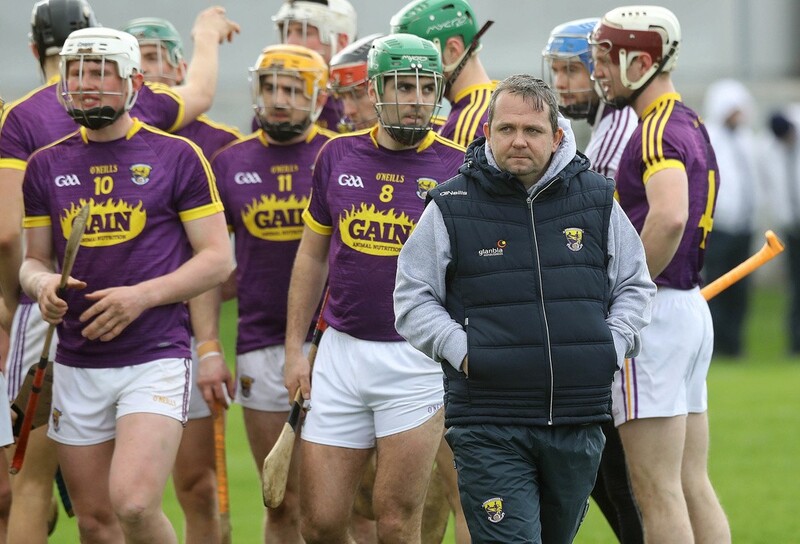 Paul Morris, Jack Guiney, Conor McDonald and Lee Chin have all been appointed freetaker by Wexford in recent seasons, only to have been relieved of the duties. Midway through this seasons National League young Rory O’Connor stepped up to become the freetaker and was certainly an improvement. But we can see from the Kilkenny game he had a dip in his success rate. Without a top freetaker it will be hard for Wexford to come out on the right side of tight games like Saturday night’s thriller in Nowlan Park. If they had upped their freetaking to just 75% they’d have won the game. Players like Joe Canning, Pauric Mahony, Shane Dowling, Pat Horgan and Jason Forde are top of the range freetakers, and make teams think twice about fouling. Kilkenny had no such fear of punishment against Wexford. They could play right on the edge, knowing that if they fouled Wexford out the field, it would be 50/50 whether Wexford would score. Either way Kilkenny would get the ball back. As Davy Fitzgerald said himself on Saturday “they got a lot more scores from their frees than we got from ours. Look at the positions, look at where we got our frees. You can say I’m whinging – I’m not. I work on statistics, on fact”. What would Wexford give to have TJ Reid and Eoin Murphy hitting their frees. Offaly, going by the rules currently in place, will have their senior hurlers relegated to the secondary competition, the Joe McDonagh Cup, for 2019. They had started the year brightly with a good win against Dublin, finished with a walloping against Dublin, and had a narrow loss to Kilkenny in the league. It was a disappointing year. I’ve put together some Offaly Senior hurlers stats from the last 5 National Hurling Leagues and All-Ireland Championships. From 2014 to 2018, these are the basic numbers the Offaly hurlers put up summarised. Offaly had a total of 49 league and championship games over the 5 seasons. In this time they won 15 games, lost 33 games and had 1 draw. Their total points difference was -278, which is an average loss by 5.67 points. Most notable are 13+ point average losses against Clare, Galway, Waterford, Tipperary and Kilkenny over the past 5 years. 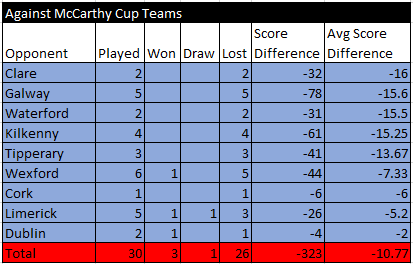 Here is the Offaly record against teams currently competing in the Liam McCarthy Cup over the last 5 years. Against Liam McCarthy Cup teams, the reading is stark. Offaly played 30 times against the top 9 teams in the country in the last 5 years in competitive hurling. They managed just 3 wins, 1 draw and 26 losses. Their total score difference over those 30 games is -323, an average of almost 11 points per game. 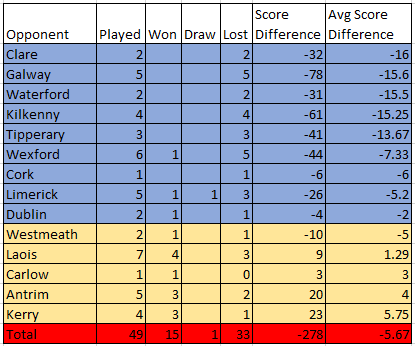 Even against teams like Wexford and Limerick, who have had tough times over the last 5 years (this year apart), Offaly have a pretty poor record of played 11, won 2, drew 1 and lost 8. Looking then at the Offaly record against those teams in the Joe McDonagh Cup, here it their record over the same period. Here we can see Offaly fared better. 19 games, with 12 wins and 7 losses and a positive points difference of 45, an average of 2.37 per game. Offaly didn’t play Meath in either National League or Championship in this period. There are two sides to the argument as to whether Offaly should remain in the Liam McCarthy Cup. I watched Ger Loughnane on RTE’s Sunday Game the other evening and he was quite passionate that Offaly should go down to the Joe McDonagh Cup and regroup. I’ve also seen other pundits like Tom Dempsey and Liam Sheedy speak about the need to keep Offaly at the top table, lest an elite hurling county be lost – there are only 10 and it would be a real shame were we to lose one. From what the numbers say, Offaly belong in the Joe McDonagh Cup. They do not belong in a competition where they take 13+ point beatings on average from many of the teams. They have a losing record against every team in the Liam McCarthy Cup except Dublin. 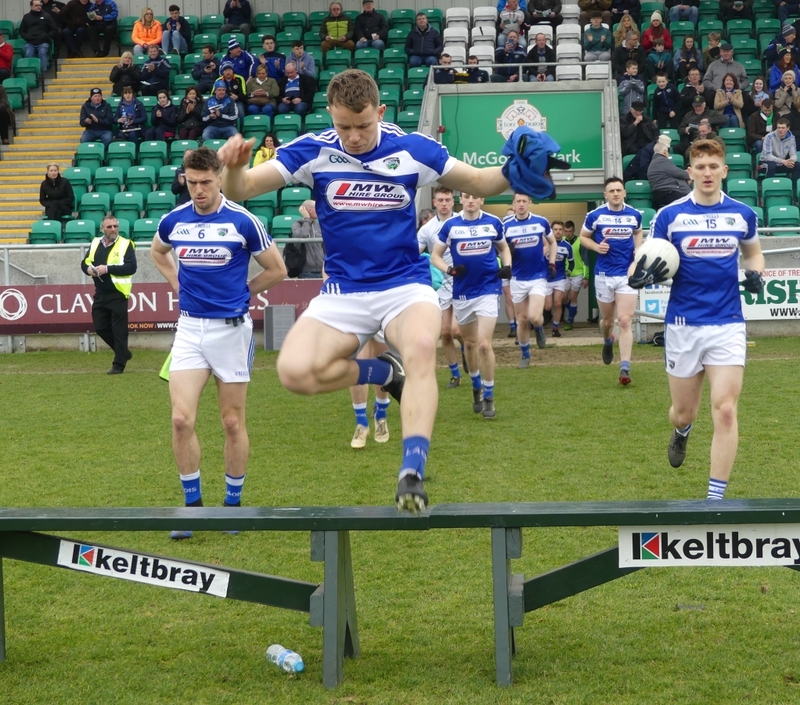 Against the Joe McDonagh Cup teams they have played over the last 5 years, they have a winning record, but still have lost to Kerry, lost to Westmeath, lost twice to Antrim, and three times have lost to Laois. Against these 5 Joe McDonagh Cup teams, they on average outscore their opponents by slightly more than 2 points per game. Sadly, for whatever reasons, this is Offaly’s standard. It’s easy to understand where Tom Dempsey and Liam Sheedy are coming from, it is such a shame that this is where Offaly find themselves. It is a shame that there are really 9 teams who are competitive in a 10 team competition this season, and a tragedy for a game trying to grow itself if one elite team falls. But the horse has already bolted. Offaly haven’t been a top team for a long time. The numbers speak for themselves. The hurling community has done it one way for a long time. There have always been enough teams that Offaly could win one extra game to stay up. 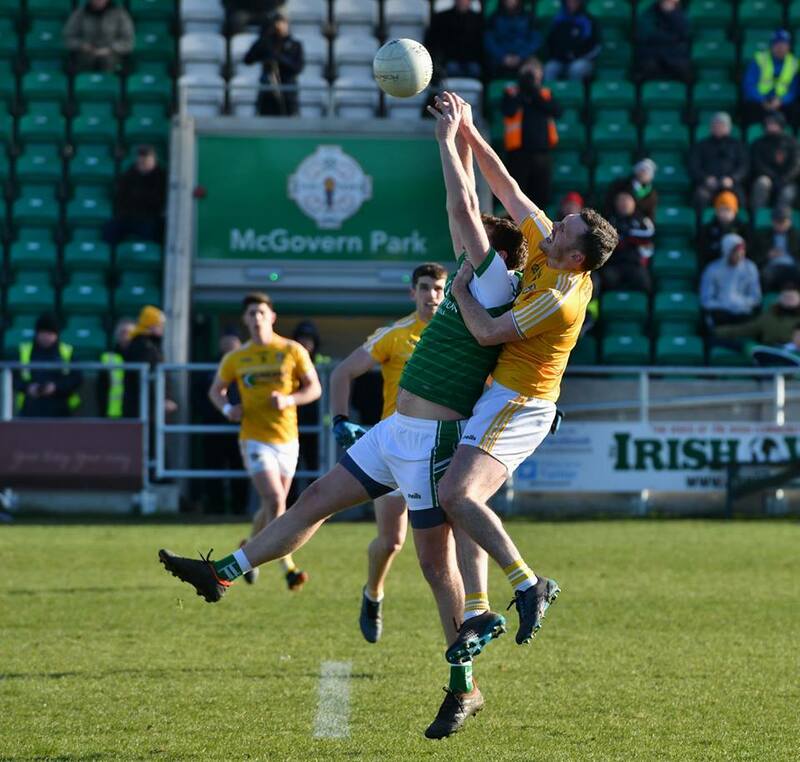 In 2014 when Offaly had lost a relegation playoff to Antrim to be bottom of Division 1B – the playoff meant they could beat Kerry in a relegation/promotion playoff to stay up. The current format seems to be working and it has been a very enjoyable championship. Both Anthony Daly and Davy Fitzgerald have said we need one free weekend in the middle of the round-robin section, and I think this will happen next year. The 10 team championship is working. Likewise there have been some very good games at Joe McDonagh level. I hope this is retained for next season with one up and sadly one, Offaly, down. On Sunday I attended the Leinster Senior Football championship semi-final between Kildare and Meath in Tullamore. It was a roasting hot Saturday evening and I headed down with my dad, eager to see what I thought would be an excellent match between two up-and-coming teams. Cian O’Neill had looked to be building a very good Kildare side and achieved promotion to National Football League 1. My dad and I had gone to watch Meath play Louth in their opening fixture in the Leinster championship, and as I had seen Louth a few times previous and know their level, we were very impressed with Meath that day. So we figured this semi-final would be a belter. As in Parnell Park a couple of weeks ago, we arrived at the ground over 90 minutes before throw-in, with unrestricted seating in the stand it’s the only way to get good seats. For both games we got great seats and we saw everything (including a Kildare player who should have got the line!). As someone who works coaching, analysing and mentally preparing teams, I’m intrigued by all aspects of the game – warmup, manager body language, player body language, how the players communicate, substitutions, everything. At 6:00pm on the dot out came Kildare to a big cheer from the supporters on the terrace on the far side. Their management had their cones and gear laid out well in advance, all organised and under control. They got into their warmup, doing a few different drills, all stuff they did without supervision. While Kildare were warming up, Meath backroom staff came out to set up their cones and equipment, and at 6:13 Meath came out to a massive pop from the crowd. When they came out all their gear was well organized and ready too. Meath worked away at their warmup, again the players knew what their routine was. I had been at Parnell Park a fortnight previous and recognised the drills they did, for example a wheel-shaped truck-and-trailer foot & hand passing drill that took up most of their half of the field, and a very good defense drill along the end line where they work to repel attackers. Meath, being traditionally old school, spend a lot of time in unstructured play in their warmup too, shooting for points or goals and passing amongst themselves. Paddy O’Rourke in the Meath goal spent a good period of time practicing his kickouts with the sub goalkeeper. During their warmup, Kildare left the field at around 6:23 and re-emerged at around 6:40. Meath stayed out on the field from 6:13 onwards. Kildare’s warmup was a little more structured than Meath’s. A lot has been said and written in the days since Meath were hammered by Kildare, for some reason a lot of this has focused on their warmup. It was a hell of a hot evening in Tullamore. Meath has a new manager this year in Andy McEntee and their warmup has changed considerably, I’m sure, from that of his predecessor. It wasn’t the telling factor in their loss of the game though, nor was it the reason they beat Louth well a few weeks back. Those who are pointing to the warmup as the reason behind the poor Meath performance are either deliberately or unconsciously deflecting attention away from the real reasons behind Meath’s loss. If Meath were tired after that warmup then they aren’t fit enough to stay with a team as well prepared as Kildare. Here, in my opinion, are the reasons that Meath lost. Meath cleared out their forward line, leaving two men inside, McMahon and Lenihan. These two had been well-used in the game against Louth (where Louth have had no sweeper since Derek Maguire headed to America). 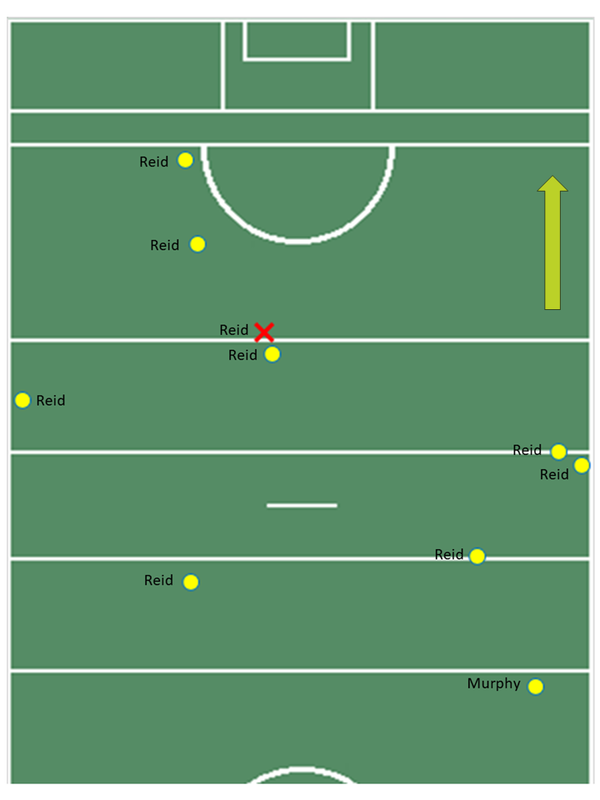 Meath played the ball in deep to these two against Louth, and then their pace men, particularly Graham Reilly and Cillian O’Sullivan, fed off them and caused Louth considerable damage taking the ball at pace heading for goal. Against Kildare, this couldn’t happen. Kildare used a sweeper, Eoin Doyle, in front of them. Meath tried for almost the whole first half to put the ball in and then chase it looking to feed- this fell down as Lenihan and McMahon could barely win a ball between them due to poor quality ball, poor quality runs, and the excellent positioning of the sweeper. Meath have gone with one fielder and one runner at midfield, rather than two fielders. 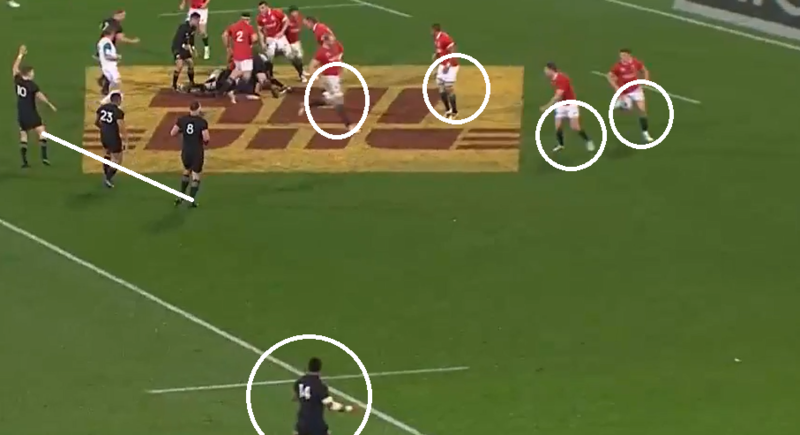 For their kickouts, Ronan Jones made runs to drag his man away from the centre of the field. If his man followed it would leave space for his partner Menton to be kicked the ball. 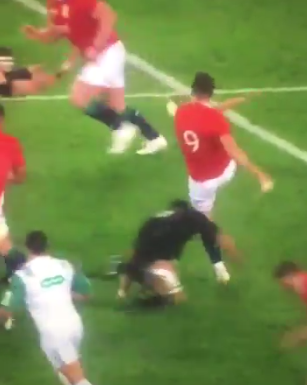 If his man didn’t follow a shorter kickout to Jones could be made. This didn’t really work at all. Kildare put a few men around Menton and with his marker Kevin Feely just as good in the air, Kildare either won clean ball or had numbers on the breaks. Kickouts put Meath under severe pressure throughout the game, with Paddy O’Rourke eventually trying to find Cillian O’Sullivan, by no means a big man or noted fielder with long kickouts. Meath badly needed a second (and third and fourth) kickout option. Meath refused to carry and pass to break the Kildare defence down. Only Cillian O’Sullivan and Bryan Menton did this with any real threat for Meath in the game. O’Sullivan worked his balls off throughout, and while his final ball let him down at times, mostly this was due to having no support. To hear the abuse he got from his own fans was shocking. Padraig Harnan and McEntee from wing back tried to support by making overlapping runs. The other Meath forwards were ineffective and seemed to not understand they needed to change their gameplan. I’ve been to a lot of games in my life, and this was the first time I saw a player at county level not really make much effort at all. One Meath forward spent most of the game hovering around the centre-forward position, and made little to no effort to get involved in the play. If his man was passed the ball he’d jog over to him but in the entire match I would say he reached maximum effort only three or four times. Even with his teammates running closeby him, he never looked for a pass but twice. Up until he was substituted with about 15 mins left to play, Meath effectively had only 14 players. Clearly something was mentally or physically wrong with the player and I hope this can be remedied as he has serious talent. Kildare are a more complete team than Meath right now. I couldn’t see any real weaknesses in their team. They look finally to have some quality forwards rather than their tradition of relying on one or two stars to fire the majority of scores. They are very shrewd. Several examples of this: Meath man marked Niall Kelly with Mickey Burke, a sensible option to be fair, but Kelly pulled Burke here, there and everywhere and left the centre-forward position empty for Kildare to run into. Another being the deployment of Doyle as sweeper. Another being the use of Ollie Lyons to provide the overlap in attack. They could think quicker on the line and play and think better on the field than Meath. Sadly, the media has jumped on the warmup. Lads who weren’t in Tullamore on Saturday night talking about things they didn’t see. Lads who were in Tullamore talking about things they don’t know about. Meath management and analysts will, I hope, see what the real issues were and will remedy them. 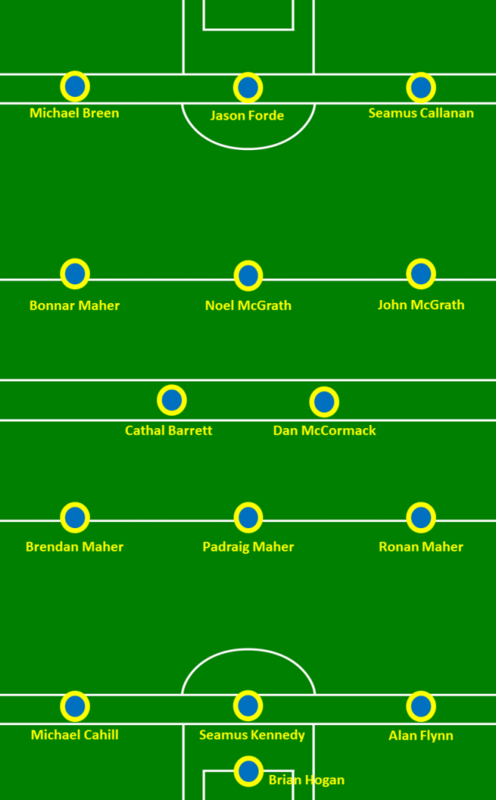 This is a good Meath team. They are going the right direction. A couple of changes to personnel such as moving Jones to wing forward and bringing in a fielder at midfield, dropping Wallace and Reilly and bringing in O’Coilean. I’d leave Burke in the corner and allow Keogan to hold the centre-back position too. Their problems in this game, as I outlined, are fixable. But lads whingeing about the warmup? Just lazy analysis, plain and simple.